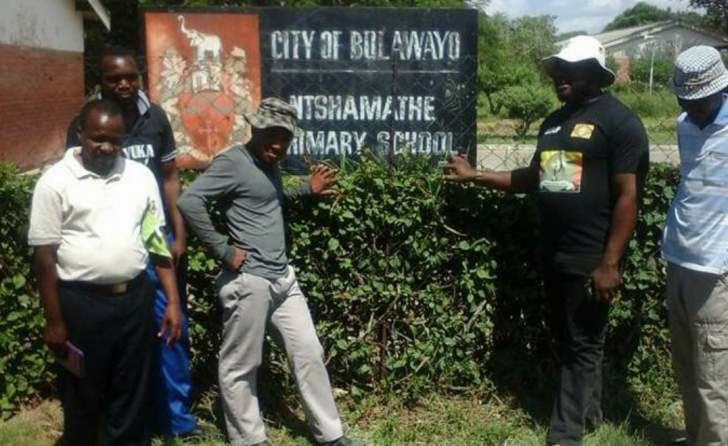 An Mthwakazi Republic Party delegation led by its foreign affairs Secretary Njabulo Ngwenya and National youth chairman Xolani Ncube, has visited Ntshamathe Primary school on a fact finding mission, following a viral social media outcry over improper teaching of Isindebele at the school. The social media message, purportedly from a concerned anonymous parent, alleged of an incident where a Shona speaking teacher had fused shona words in the teaching of ISindebele. "Team MRP can verify after a candid consultation with the school management that the said social media story was a hoax and fermentation of lies. The school management led by the headmaster, Mr Tapela welcomed the team cordially and allowed access to student material for scrutiny," said MRP. "He went out of his way to bring, not only the grade 2c books, but all grade 2 books for verification of such allegations. The team went through each and every book and evidence was contrary to what is circulated on social media. Evidence was also availed to the team, ascertaining that lower grades at the school are taught by Ndebele speakers." "We applaud the provincial Education office for swiftly responding to this alarm. They were the first to arrive at the school to get first hand information. Such a response exhibits their seriousness in protecting the fundamental rights of our children as enshrined in the UN declaration charter of children's rights." "We condemn with all might, the reckless and irresponsible use of social media platforms by citizens of Mthwakazi. We are an iconic nation and we must all endeavour to protect our reputation." The party said they humble appreciate Mr Tapela, the school head and his seemingly determined staff.